A warm breeze, the unmistakable scent of life and growth, the riot of colors in the blooms of early flowers — all are welcome harbingers of warmer, brighter days to come. That’s perhaps why the traditional Mount Holyoke College Flower Show remains a perennial (ahem) favorite among Western Massachusetts residents. 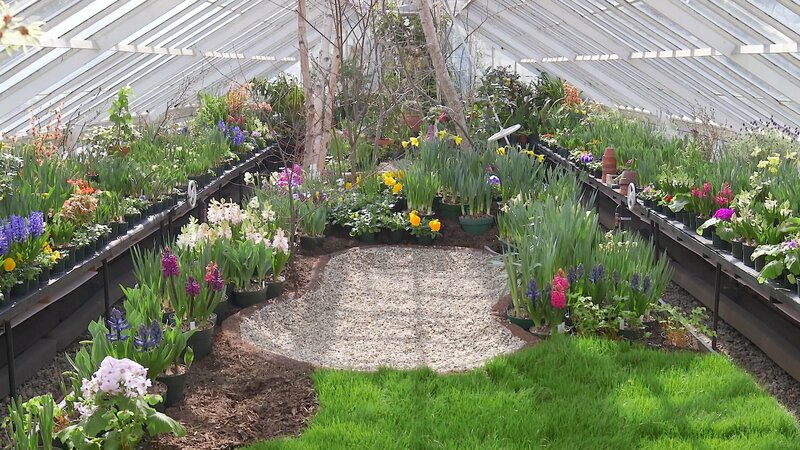 This week, the College invites the winter-weary community to enjoy a festivity of flowers at its 55th annual spring flower showcase, opening Saturday and running through March 19 at the Talcott Greenhouse. The show will be open from 10 a.m. to 4 p.m. daily. The greenhouse is wheelchair-accessible. This year's theme is “spring pools.” The central bench of the greenhouse will feature three still-water features surrounded by cut branches budding with early flowers and a selection of tulips, daffodils, narcissus, hydrangeas and more. The flower show takes part in one wing of the greenhouse, but Clark hopes visitors will be enticed to explore the entire botanic garden, including the outdoor gardens, to take in the sights — and smells — of the coming spring.